Now that PHP 7.1 was released pure CPU benchmarks reveal it is 27 times faster than PHP 5.0. This was one of the main topics discussed by Manuel Lemos and Arturs Sosins on the episode 78 of the Lately in PHP podcast now also being streamed using livecoding.tv. 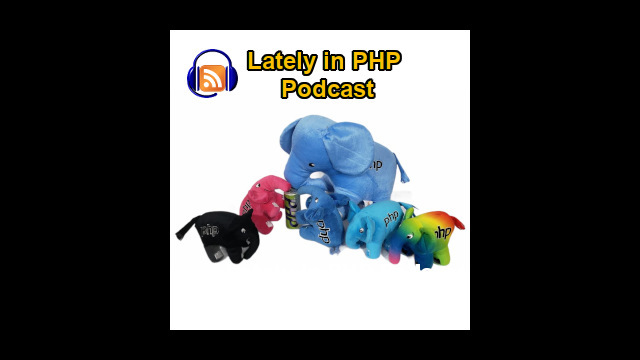 In this episode they also talk about the upcoming PHP 5.6 end of life, features being deprecated and more being proposed for PHP 7.2 like interval comparison, type locked variables, function overloading by extensions, the latest PHP modern practices evolution steps, etc.. This article also contains a 5 minute video and the transcript of the podcast summary. This month we are going to cover as always first the latest PHP releases starting by PHP 5.6.28 and the PHP 5.6 and that life is near, not the exact end of support because it will still have security bug fixes after 2017. We also cover just briefly, some of the latest bug fixes on PHP 7.0 but the great news of the month actually in December 1st it was the release of PHP 7.1.0. We'll talk a bit about were the improvements focusing in particular those related with performance. And for that there was another article that for now we're just cover it briefly because it was published more recently. And we'll talk about it more in depth next month but this article will cover how PHP performance evolved over time, not only from PHP 5 until PHP 7.1 but it already includes a preview of what you can expect for PHP 8 or maybe PHP 7.2 because there is a JIT engine being developed and there are some improvements that are already shown in this article. Then we start to cover the usual set of proposals for the next PHP version. There was a proposal here regarding comparing some value with an interval. There was some discussion but I think there was no agreement on the what would be the best syntax for this that will not cause any conflicts with the current PHP syntax. Then we'll talk about a proposal regarding type locked variables, I mean variables that once you assign them that you cannot change the type, you can change the value but not the type. Then we'll talk about what is planned to be deprecated in PHP 7.2, I mean things that start issuing warnings if you're still using them because they'll be removed in future PHP versions. Then we'll talk about function overloading which should be basically to be able to override existing PHP functions. In the case using extensions. Then we talk about a proposal to improve the array iterator interface with a few more functions. And then we also talk about certificates that are being used for PHP to make HTTP SSL requests, so they start distrusting the certificates that use the SHA-1 hashing. Then we talk about a proposal that will allow subclasses to not be required to declare type hinting for a function that is redefined. And then we'll talk about some more recent modern practices in the PHP community and that include not only things that only work on PHP 7 but as well that the extensive use of traits and also packages that implement the PSR interfaces defined by the FIG - the Framework Interoperability Group.